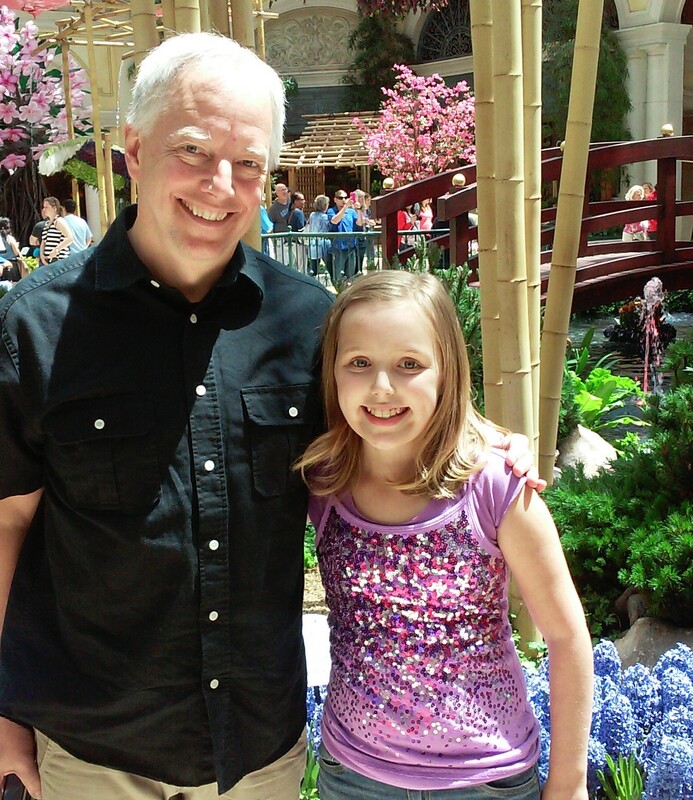 When Dr. Olson met young Avery, back in 2011, he thought he had her brain tumor diagnosis right. Avery’s mom, Stephanie, says that her daughter’s story began in 2010 with petit mal seizures. Doctors originally thought this tumor wasn’t causing any harm, describing it as a “freckle.” So, when this bright, strong-willed, and spunky girl started seeing double a few months later, the family and the doctors became concerned. The doctors did a biopsy, immediately followed by a fifteen-hour surgery to remove as much of the tumor as possible. The pathology led Dr. Olson and Avery’s care team to believe that Avery had pilocytic astrocytoma, a grade 1 tumor that is very rarely fatal. However, six months later Avery’s eyesight began to worsen, and the doctors made the recommendation to start a year of chemotherapy. The chemo helped, as bits of tumor left after the surgery showed no signs of change on MRI scans. It was during this time the family moved to Las Vegas. Despite undergoing months of chemotherapy, Avery showed great spirit in fighting her cancer – in addition to playing piano, she participated in St. Baldrick’s head-shaving events and even starred in a “Do What You Want” video. This relentless determination to help fight pediatric cancer was one reason she was named a St. Baldrick’s Ambassador in 2013. Dr. Olson stayed in touch with the family for the next couple years. In 2014, the family moved to Phoenix for work. There, the pathologist at Phoenix’s Children’s Hospital reevaluated Avery’s tumor tissue samples, and now had a new diagnosis of ganglioglioma – a rare tumor of the central nervous system. Yet, since Avery was no longer in treatment and the tumor appeared stable, no changes to her treatment needed to be made, despite the new diagnosis. So how was it possible that Avery’s diagnosis had gone from a grade 1 to a grade 3? Part of the answer might lie in genomic analysis – the kind that Dr. Olson is currently studying, thanks in part to funding from St. Baldrick’s Foundation. Dr. Olson is currently working on a clinical trial using genomic analysis to improve the accuracy of brain tumor diagnoses. This research has the potential to help doctors at every stage of a treatment regimen for children with brain tumors. Involving more than 200 institutions that are members of the Children’s Oncology Group (COG), it’s part of an effort to radically improve upon traditional methods of diagnosing brain cancers in kids, which Dr. Olson believes are “deeply flawed”. Genomic analysis looks at the molecules in the tumor, with the hope of providing a much clearer picture of how a tumor may develop over time. A more accurate diagnosis and a clearer picture of how the tumor may act will, in turn, allow for the development of a more effective treatment protocol. Dr. Olson, who also leads the pediatric brain tumor research program at the Fred Hutchinson Cancer Research Center (FHCRC) in Seattle, is specifically focused on two types of brain tumors: medulloblastoma and primitive neuroectodermal tumor (PNET). The problem, Dr. Olson noted, is that “tumors that look exactly alike under a microscope can have very different biology and require entirely different forms of treatment.” This could be the reason that doctors struggled to accurately diagnose Avery’s tumor. Avery’s story has a similar ending to many children who are diagnosed with brain tumors. She passed away in the summer of 2016, at the young age of 13. Dr. Olson is determined to use the funding provided by St. Baldrick’s to develop diagnostic tests that lead to better outcomes for kids like Avery. “I think we need to keep our expectations set and just keep working our butts off to make whatever progress we can make as fast as we can,” he said. And Avery’s Mom, Stephanie, agrees, suggesting that a genomic analysis of Avery’s tumor at its first discovery could have made a difference in Avery’s course of treatment. Stephanie and her family stay involved with St. Baldrick’s, and, since they now live back in the Las Vegas area, they will be part of the annual event at McMullan’s Irish Pub, one of the longest-standing St. Baldrick’s head shaving events. Dr. Olson’s research has included innovations like using scorpion venom to develop tumor “paint,” which lights up and sticks to cancer cells, showing surgeons what is a tumor and what is normal tissue. Stephanie says he brings the same creativity and passion for research to this latest trial. And this connection with Dr. Olson helps Stephanie honor the memory of Avery, the girl with a big personality that just wanted to be a normal kid.